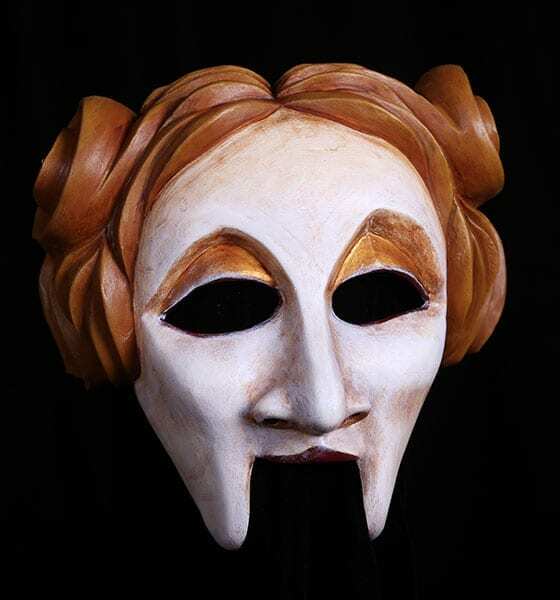 The Cleanthis character half mask was created for the play, Amphytrion by Moliere. The mask is also a terrific mask for Greek Theater. Cleanthis, maid to Alcemena, and wife to Sosia. She and her husband provide a counterpoint to the marriage of Amphytrion and Alcemena. The mask of Cleanthis is one of severity, desire, jealousy, envy and scorn. It’s the perfect combination to provide for a calm and loving marriage to a man such as Sosia. This mask would as a mask for schools, colleges and universities as classroom equipment for the training of actors.